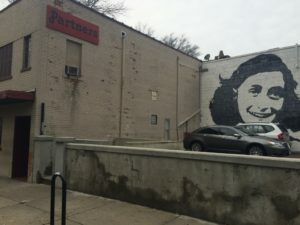 The Anne Frank mural is a newer addition to New Haven’s historic gay bar. “In the early eighties, Yale was Out and Proud, but New Haven’s homegrown nethersexers were, I regret to say, Still a Little Ashamed. Partners Café, at the corner of Park and High Streets, drooped accordingly. Outside, the club was surrounded by scabby triple-deckers with trash nests under the stoops and spent bottles in the tree boxes. Inside it was a template of the times, starting with the Betty Boop hand stamp and the two-dollar cover, continuing with the faux-Tiffany lamps over the bar, the glass brick windows, the Broadway partisans yodeling Jerry Herman around a piano below, Donna Summers and Blondie caterwauling above, and everywhere a tangy miasma of smoke, desire, sweat, poppers, and urinal pucks.